New Bedford, MA – AFC Cable Systems, Inc., a leading manufacturer of electrical products, announces the launch of their Luminary Fixture Whips for lighting, power, and appliance applications. 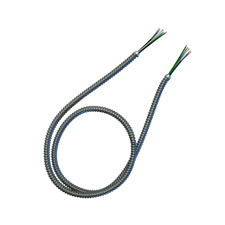 Ideal for work that requires short lengths of cable, these pre-cut lengths of conduit are pre-wired and supplied with leads cut to the proper length for termination and the proper connector on each end, reducing the time spent cutting and splicing at the job site. Luminary Fixture Whips come with lead lengths of nine inches on each side and are manufactured with ½ flexible conduit with snap-in connectors. Luminary Fixture Whips are ideal for LED and fluorescent dimming applications. All whips are UL listed under File No. E96572 and are provided with solid or stranded copper conductors with standard 120/208V colors. Available in barrels and cartons, custom colors are available by request. AFC Cable Systems, Inc., part of Atkore International, is a leading manufacturer of electrical products, tracing its origins to 1926. AFC supplies a broad range of innovative, cost-saving products to the electrical industry. These products include: armored and metal clad cables, flexible metal conduits, non-metallic, and liquid-tight conduits as well as modular wiring systems, and electrical fittings. AFC Cable Systems provides products used in new construction, restoration and modernization of commercial office buildings, institutional facilities, healthcare, and more.